Successfully Added Remote Control Presentation Laser Pointer + Receiver to your Shopping Cart. 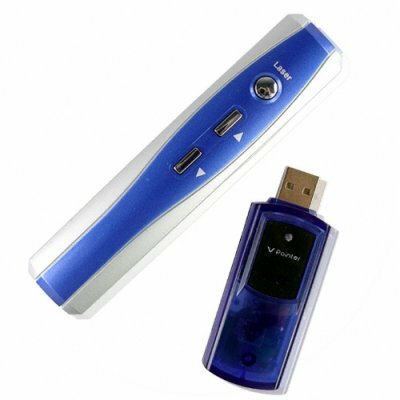 Wireless presentation tool consisting of a handheld laser pointer/mouse for controlling Microsoft Office and internet pages and a receiver with plug and play compatibility with most OS's. If you have a need for large presentations, and want to stand and be heard as well as possible as you zoom through pages of your notes or webpages, this is the USB computer gadget for you. Simply press the page up and down for convenient control over your presentation, and at the same time point out important details with the long range, powerful built in laser. A handy tool, with many practical applications, available direct from Chinavasion at a super low wholesale price. Get yours now!